Living in such a food-centric city like Atlanta, one of my goals is to try as many of the world-class restaurants that this city has to offer during my stay here. So, I figured this year when I check out or discover a new joint, I will let all of you in on the grub. 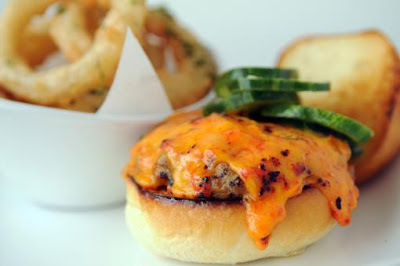 So the first new spot to check out in '09 is Top Chef alum David Blais' Flip Burger Boutique. Flip is one the new trend of chic burger-focused restaurants popping up in hot cities such as L.A., NYC and of course, Atlanta. The AJC details that Blais is serving up gourmet burgers made from beef, house-ground of short ribs, hangar steak and brisket. In addition, Flip offers turkey, codfish, a shrimp "po boyger" and the "turf and earth" (goat cheese and white truffle butter) burger for the non-carnivorous diners. The burgers are mini and range in price from $6 - $11. The kitchen rotates a menu of about 30 burgers( the southern country fried burger shown above). 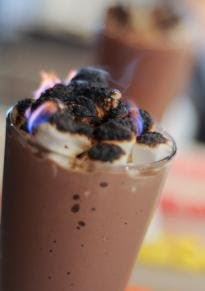 Sides include signature dishes such as tempura dipped rutabaga fries, vodka battered onion rings and Blais' incredible creation of liquid nitrogen frozen shakes that come out the kitchen smoking (flavors include Krispy Kreme, Sweet Tea and Nutella [shown here])! I will be checking this spot out with some friends on Friday and I will be sure to take a couple flix to post here.